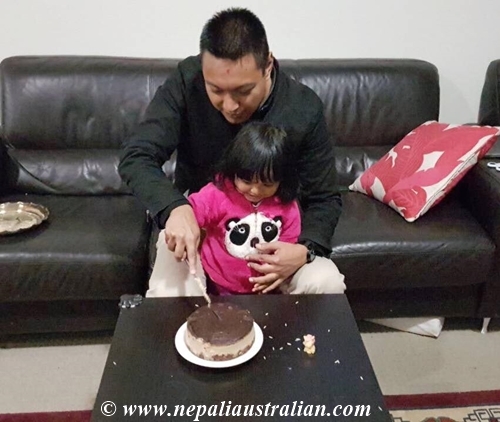 On Monday , 21st of August was Kushe Aushi (Nepali Father’s Day) and today is Australian Father’s day so we celebrated both the father’s day in very different way for AS. 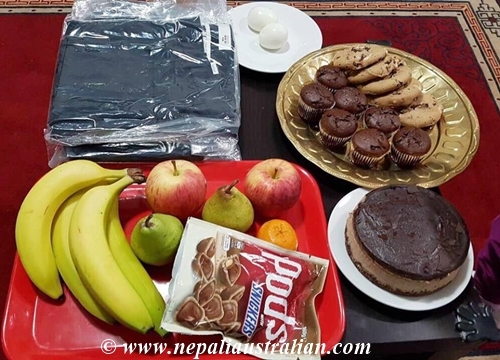 I always want Chhori to understand Nepali culture and traditions so for Nepali father’s day, it is important for me to show her the traditional way. As it was weekdays, I went shopping after work and prepare for the celebration. 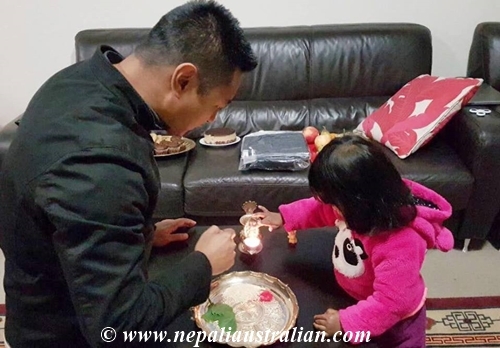 Chhori is 2 and half years old now so it is more fun this year than before as she can understand and take interest on what we are doing. As she is old enough, AS and I gave her direction and she followed them very well. 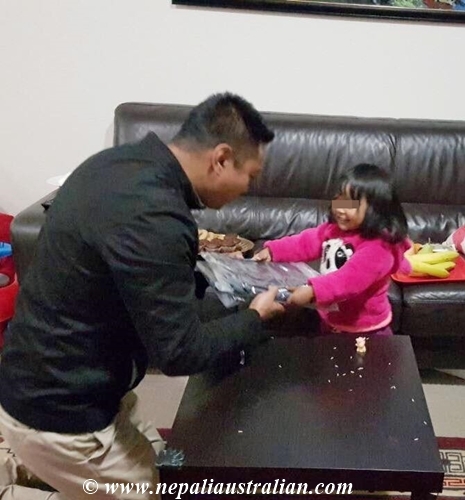 We had so much fun, her putting tika, sagun and cutting cake. 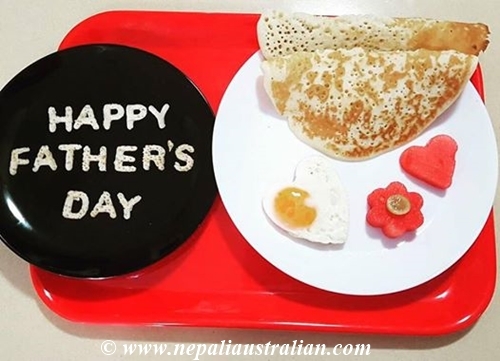 Today , I made breakfast to AS with the help of Chhori and she said “Happy Father’s Day Papa”. It is so sweet to see them together. 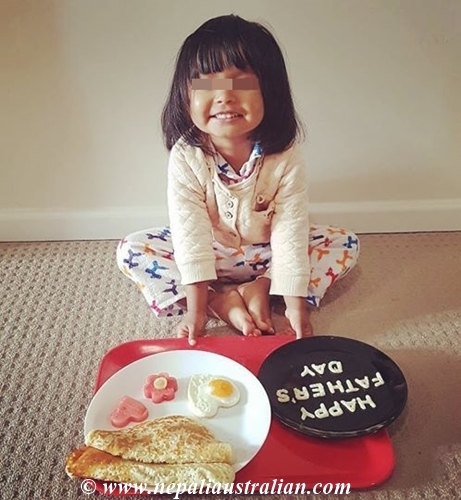 We made pancake , heart shaped eggs and some fruits. 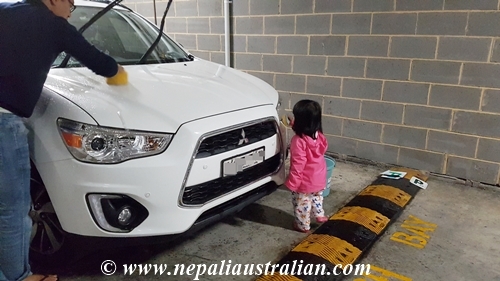 Then she help her papa wash our cars. She was so excited to help. 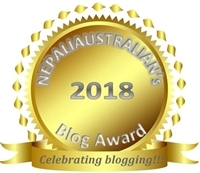 This entry was posted in Being Mum, Celebrations, Nepali Culture, Nepali Festivals and tagged Australia, australian, australian nepali, Cake, car wash, chhori, daughter, father, Father's Day, father's day in nepal, first father's day, holy grass, Kushe Aunsh, Lord shiva, M from nepaliaustralian, Nepal, Nepalese, Nepalese Father's Day, Nepali, nepali australian, Nepali blog, nepali father's day, Nepaliaustralian, pancake, rice grains. Bookmark the permalink. Nice pictures. 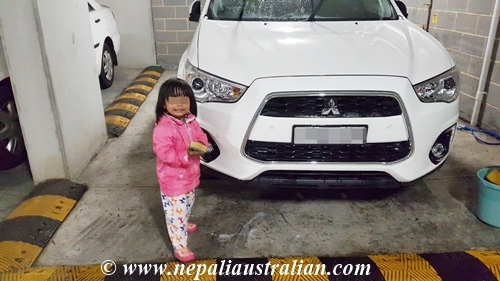 Yes true, We should teach our children about our culture. And everything.